Who am I: My name is Anita and I am a Bay Area native, living and working around San Francisco, whose lifelong addiction to all things sweet has developed into a happy baking and photography hobby. 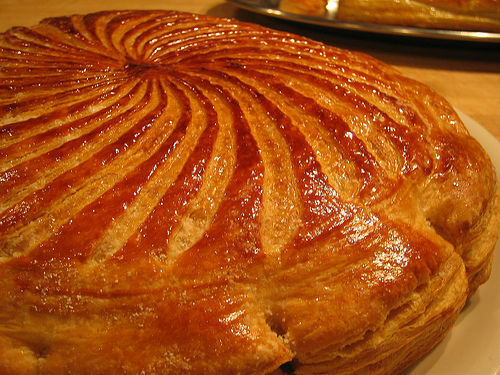 Where I've been: In 2005 I took a six-month professional pastry course at Tante Marie's Cooking School, which focused on classic French patisserie. I braved the perils of burning sugar, overwhipped egg whites, and melting fondant to make croissants, croquembouche, and tarte tatin. A record of my travails can be found at my Flickr page. Where I'm going: I haven't made the jump to full-time pastry; instead, I got hooked on documenting my and my classmates' creations during pastry class. Right now I enjoying baking what suits my fancy (I am working my way through several of Pierre Hermé's books) and taking pictures of them. I hope you enjoy them! I am also available for freelance work as a food writer, stylist, and photographer. Please contact me at pastrygirl.dessertfirst(AT)gmail(DOT)com. Baking911 - Feature recipe in November 2007 newsletter. Photo shoot for private client, July 2007. C&H SweetTalk - Profiled in summer 2007 newsletter. Schmap Travel Guides - Food photos selected for Schmap Paris Guide. Congratulations on your site!! Such a great start for all your pastry adventures. Here's to all the fabulous creations I can't wait to see (or taste). Wonderfull idea on creating a site for sharing your baking advantures. Will this become a menu for our tasting advantures as well? Of course you will be next in line!! I need to share these creations so I don't have to eat them all myself! Hi Anita - I'm so happy you've finally got your own blog! Everything looks great, I'll keep coming back here not just to enjoy your gorgeous creations but also to ask stupid questions about pastry making (hope you don't mind...) Happy blogging! Whoa, Anita! I am so impressed--great job. A LOT of great stuff on here. Can't wait to scour your site top to bottom for all your tips, recipes and links. ; ) Hopefully I can contribute back and give you some ideas as I'm testing in my kitchen as well! You are absolutely beautiful. Marry me! 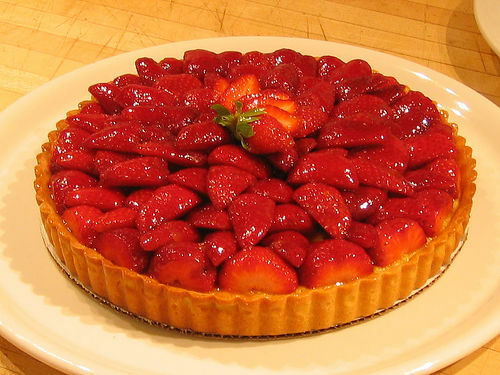 Hi Anita, came to your website from another Food Blog and its been a pleasure surfing thru the pages. The desserts look amazing, I love baking and am surely going to revisit your pages again and again to try out the recipes. What lovely pictures, I hope I come close to making my desserts looks even a bit as tempting as shown here. Keep up the good work. You will have to let me know how your like the course! Best of luck! Thanks for stopping by. I'll e-mail you my opinions. Thanks for visiting! I think your blog is great too, congrats on being featured! I'm glad you like the blog. Come by again, let me know how your baking is going! Thanks so much for visiting and for the kind words! I friend just told me about your blog and I was thrilled to visit and see your gorgeous photos of our favorite cookie, Pierre Herme's Korova Cookies, now known as World Peace Cookies. Isn't it extraordinary that something so simple and so easy to make can be sooooooooo good! I'll be visiting often to admire your beautiful work. I want to send you the hat that you wanted... where should I send it? Also do you want one for yourself as well or just your sweetie? I'm looking for 1 1/2" tartlet tins, and for some reason, my browser has taken me to your blog. (I can't find any, by the way!) How delightful your website is, and your pastries and photographs are beautiful. I, too, am here in the Bay Area, and I've always loved baking. The picture of the colorful Macarons intrigues me, and I would love to know more about them. Do you have a recipe for them here? Thanks for the enjoyment of having visited you, and keep making your creations. They're lovely. You've got gorgeous photography on this site! I espeically like the Mozart cake. I read that you went to Tante Marie - what was your experience like there and is the school expensive? I've been thinking of a career change - any insight you have would be much appreicated. Thanks! On my never ending search for a shortbread bar like the Eileen's Buttery Shortbread bars, I keep ending up at your site and I'm really glad. 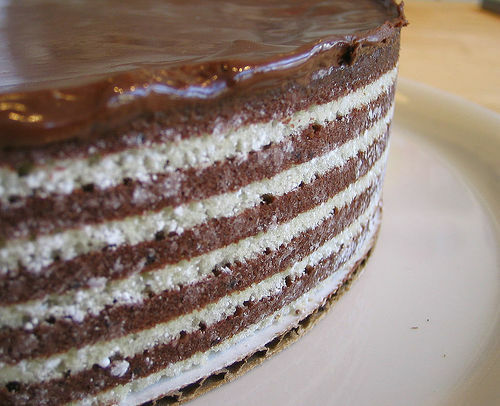 The first time I visited your site, you had made the Black and White Cake from Dorie Greenspan's new book. I made it for my son's birthday and it was not a big hit. I guess we just prefer chocolate cakes. I've been making the Sour Cream Chocolate Cake from San Francisco a la Carte for years and it is a family favorite. This time, I found your piece on Cocoa Bella. We found it on our first visit to Bloomingdales and now it is a must do. It's not even that bad on our waistlines because I can't afford for it to be! Could you possibly give me some tips on how I might recreate the Shortbread bars from Tom's Cookies? Most of the recipes I try taste more like Lorna Doones. Great and inspirational site! Just wondering what your thoughts are on your experience at Tante Marie's. Any one thing a novice baker should aboslutely know? I love your site and will try the goat cheese cheesecake recipe. I just love reading your site and seeing all those pretty pics u post. I am an international student studying in the Bay Area and am considering doing a pastry arts program after I graduate. Right now I'm torn between the program offered by Tante Marie's and the California Culinary Academy. I'm more for the experience than seeing it as a career. What are your opinions or recommendations? Thanks and keep up with the good work. great site and great photos and great work! you inspire me really! Keep up the good work Anita , its always a pleasure visiting your blog. the hazelnut cake looks wonderful! when i went to france, the first place i went to get pastries was sadaharu aoki- for my birthday the other day i made a bittersweet chocolate roulade with maccha cream, and i thought of you both. btw, TasteTV left a comment on my blog too asking me to join them, but I'm kinda confused how to do it...I saw your blog listed there...so could you point me in the right direction please? What a great site. You have a good eye for a picture and your cakes look amazing. Wish my cakes looked like yours. Amazing site! I just stumbled upon your site while browsing for dessert related stuff. You have such amazing talents. Your baked goods look awesome and your pictures are great too! Most importantly, your blog is in my fav colors (pink & green).